What do moms really want this Mother’s Day? For many of Montana’s moms who work outside the home, one thing that tops the list is affordable childcare. 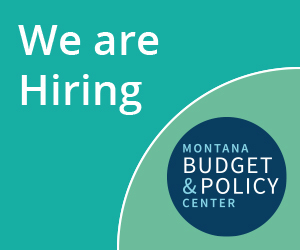 With child care costs averaging over $7,500 a year for one four year old, a typical Montana working family with one child must spend a staggering portion of its income – 13% – on child care, a new report released today by the Montana Budget and Policy Center shows. For low-income and single-parent households, this burden is significantly higher. Moms are an important part of Montana communities and our economy. In addition to raising our children, they are teachers, helping our students learn; nurses, taking care of our ailing parents; police officers, keeping our communities safe. But for many families, the cost of going to work every day adds up, forcing many working moms to decide between paying a burdensome amount of their income in child care costs, putting their children in less expensive but low quality child care, or leaving the workforce altogether. This Mother’s Day, let’s give moms what they need. Montana is one of only eight states without any state investment in pre-Kindergarten. Public funding for pre-K could help increase child care options for working families, easing some of the burden. And the benefits to children who attend high quality pre-K are numerous – they are more likely to graduate high school and go to college, and less likely to need to repeat grades or receive special education. This weekend we honor all that moms do – from helping with homework, to treating middle of the night fevers, to working to support their families. And while we are at it, let’s not forget the cost that many working moms bear in order to go to work every day. Montana should support our moms, our children, and our families by supporting state funding for pre-K.